Delhi, also known as New Delhi the capital of India, is an mixture of the old and the new. This time we want to introduce you to the top 10 places to see in Delhi India. The ancient and the modern times are in combination here, not only in the remains of a succession of empires, but equally in present social structure and lifestyles. This is the place most people think of when they consider visiting India. Delhi, Dehali, or Dilli is derived from Dhillika, the name of the first medieval township of Delhi, located on the southwestern border of the present Delhi, in Mehrauli. This was the first in the series of seven medieval cities. It is also known as Yoginipura, that is, the fortress of the yoginis (female divinities). Delhi is divided into two parts. The old Delhi or Delhi was one of the capitals of Muslim India between the 12th and 19th centuries, you can see old forts, mosques and monuments related to India’s Muslim history here. New Delhi was created as the capital by the British. It is spread over a wide area and is lined with imposing boulevards. Delhi is a major travel gateway for India travel and one of India’s busiest entry points for overseas airlines and is on the overland route access across Asia. 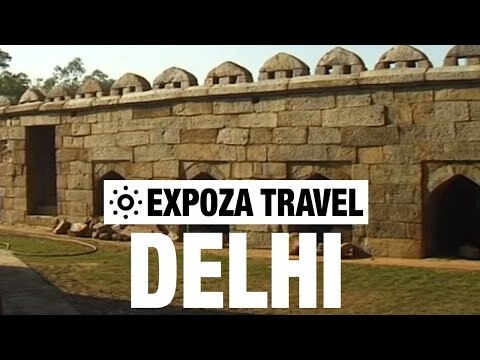 #1 on our top places to see in Delhi India are the great sandstone carcass of the Red Fort, here you can imagine the last days of the Mughal empire and the British era. #3 Humayun’s Tomb is one of the best historical places in Delhi, where Persian style combines with local craftsmanship. Take a stroll at the fiercely symmetrical Mughal gardens at dusk. #4 You can get lost and confused in the narrow bazaars of Old Delhi, but its so much fun and feel you like you are wandering somewhere medieval. #5 Among the top places to see in Delhi India is the peaceful Qutub Minar, its impressing towering minaret will remind you of an old ornate factory chimney. #6 The district of Hauz Khas, with its crumbling Mughal tombs and tempting art, antique and fashion boutiques needs to be discovered. #7 Wandering around Lodhi Gardens on a Sunday afternoon is marvelous, and one of the famous places in Delhi that is perfect for people watching. #8 Visit the former home of Indira Gandhi, and learn about India’s most powerful dynasty. #9 Take a voyage back in time and the days of the Rajon on a trip through the doors of the Imperial hotel. It looks stunning with polished hallways hung with chandeliers and numerous works of art. A cocktail a G&T in its 1911 bar is another highlight. #10 You can lose yourself to shopping, in the temples to Indian craft that are Delhi’s government emporiums on Janpath, close to Connaught Place. Of course there are more important places in Delhi worth visiting! For example the India Gate, formerly called Kingsway, built by Edwin Lutyens in 1921 and is also known as Indian Army’s Tomb. Or be amazed by the unmatched modern beauty of the Bahai Lotus Temple. Delhi is the place all travelers think about, but it is only the very beginning of the wonders India has to offer.